The world's highest observation wheel (a type of Ferris wheel). 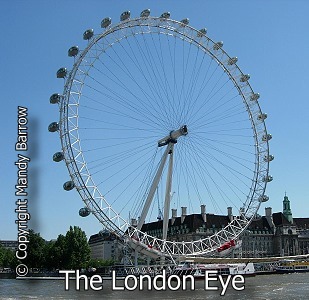 What is the London Eye? 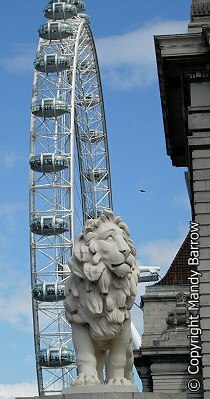 The London Eye is a giant Ferris wheel. The London Eye stands on the South Bank of the River Thames in London, between Westminster and Hungerford Bridges. It is the world's highest observation wheel. 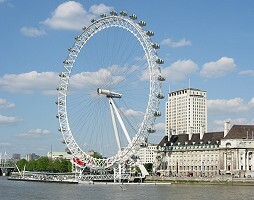 The London Eye (previously known as the Millennium Wheel) stands 135 metres (443 feet) high. The wheel was constructed in sections which were floated up the river Thames on barges and assembled lying flat on pontoons. Once the wheel was complete it was raised into its upright position by cranes, initially being lifted at a rate of about 2 degrees per hour until it reached 65 degrees. How much does the London Eye weigh? The total weight of steel in the Eye is 1,700 tonnes. How many people can it carry? How long does a ride last? The London Eye can carry 800 passengers at a time on a thirty-minute ride. From its highest point of 450 feet, it promises views of up to 25 miles. How much does it cost to go on the London Eye?